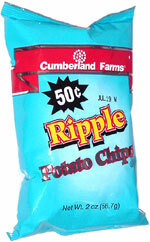 Taste test: These are good, plain, crisp, narrow-rippled potato chips. They don't have very much salt, but nonetheless have a good potato taste. 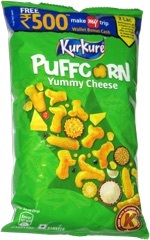 This medium-size bag cost just 50 cents, and it was filled with lots of large, unbroken chips. Smell test: Very nice, very potatoey aroma. This snack was discovered by Jeremy at Cumberland Farms at the Cleghorn rotary, Fitchburg, Massachusetts. Review published .